With more than 1.7 million of Android apps and 1.5 million of Apple Store apps fighting to be downloaded, there comes a reality that apps can’t market themselves. Even branded iOS and Android mobile app development don’t rely just on a trusted name and prestige. App developers use a number of marketing tools in order to skyrocket their ROI (return on investment). However, these efforts are not always successful. Below we describe some mistakes of app promotion campaigns. 1) Asking for ratings and reviews in an annoying way: 52% of users enable push messaging on their mobile devices. If we think how many marketing-related emails we delete without reading and translate it to push notifications, we quickly understand how easily some app developers lose users. The standard push opt-in use a user sees upon the first opening an app is definitely confusing, isn’t it? It’s better to send push notifications or ask for reviews after the user has used an app at least several times. Software development companies should stay more relevant and contextual when it comes to push notifications within a mobile app. In other words, the golden rule is not to annoy users and work out a marketing strategy based on user behavior and demographics. Imagine yourself searching for a T-shirt for a barbeque party. The mobile app sends you a notification about sales of winter jackets. Zero relevance to user activity has no chances for success. Analytics and research of user habits are the cornerstone to drive more installs. 2) Behaving in the same way in mobile and web. Many app development companies do not pay attention to the way users search in the app stores and on the web. Search queries on the web tend to be something like “do”, or “go”. 80% of app store search queries are 2-3 word phrases related to app features. App developers realize that user intent is different when search app stores and include effective elements. This is extremely important for ASO (App Store Optimization), namely, for publishing app keywords and app descriptions. For example, it is highly recommended to avoid using conjunctions and prepositions as keywords for apps, use commas instead of space to separate keywords. As for app descriptions, it is better to produce bullet points related to app features, e.g. what value it brings to users' lives. 3) Not finding the balance between organic and paid marketing. iOS and Android mobile app development has phenomena when mobile apps got high rankings and drove a number of installs. However, it is an exception to the rule. It is rather risky to stake on one thing. Normally, the most successful app development companies invest into ASO as well as into paid marketing campaigns to drive a better ROI. On the one hand, organic traffic can make up as much as half of app store traffic. A year ago, a study from ad attribution and analytics company TUNE showed that on iOS, 47% of respondents said they found the app via the App Store search engine, the corresponding figure for Android was 53%. So, spending time and money on ASO and research related to it can help app development companies drive more organic traffic. On the other hand, Android and iOS mobile app development can take advantage of CPI (Cost-Per-Install) campaigns to fuel quicker simultaneous paid and organic traffic. After all, people will not return to a mobile app just because. Gartner warns that app development companies need to focus their development and marketing strategies more intensely toward retention strategies because app users need to be convinced about the value of an app. 4) Not investing in the right mobile app install ads. App development companies benefit from mobile app install ads because they get qualified traffic across stores. However, while looking for a boost, app developers should answer some specific questions in order to get an increased ROI. How much budget should be spent on mobile app install ads? What channel is better? Facebook App Install Ads, Twitter App Install Cards, Google Ad Words Mobile App Installs, YouTube TrueView Mobile App Install Ads, etc. Each of the platforms has its own benefits and can boost your ROI. Here, app developers should decide what is matching their iOS and Android mobile app development. Twitter and Facebook are the right thing for those who rely on a fixed budget. Twitter App Install Cards and Facebook App Install Ads will be the right things for mobile app development companies who want to target users based on specific interests, demographics, or profiles. 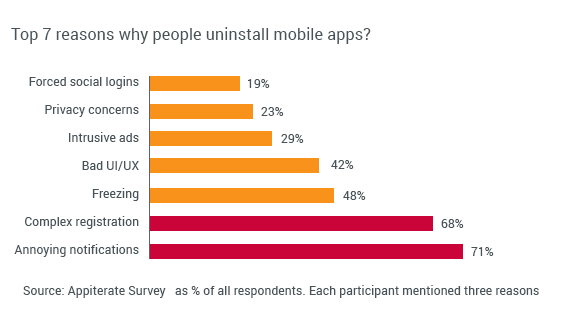 Google Ad Words Mobile App Installs can’t be targeted according to demographics. However, it is a good choice for small budgets with a focus on keywords. For iOS and Android mobile app development with a larger budget, YouTube TrueView is a great place to achieve success. 5) Targeting the wrong device and platform. The next important thing is that rules of ASO vary from a platform to platform, so do not overpay for mobile app promotion if it doesn’t read up differences, especially between iOS and Android. For example, on Google Play keywords from the app description have an effect on discoverability, in the Apple App Store they don’t. Be sure to check the practices for the relevant store. Saying more globally, app owners often fail because they, actually, do not know where their traffic comes from. These days, users require both iOS and Android mobile app development. But neglect of one platform vs. another end ups losing installs and traffic. The same thing is about targeting the wrong devices. Imagine your experience when you download a mobile app on an iPad that is iPhone only. Certain tasks will be definitely painful which will make you delete the app. 6) App development companies do not feel the necessity to offer a free app or put a price tag on it. Sometimes, it is worth charging the point of installation. The highest quality iOS and Android mobile app development can command a price for the value they deliver to the lives of their users. The bright example here is Cryptacard Mobile App. It is still an extremely successful high quality paid app six years after its release and is still on computers, tablets, and game consoles. The secret is that the app enables an outlet for artistic expression and adds more relaxing experience to the lives of its users unlike many other mobile apps. 7) Lack of knowledge how to use analytics data. 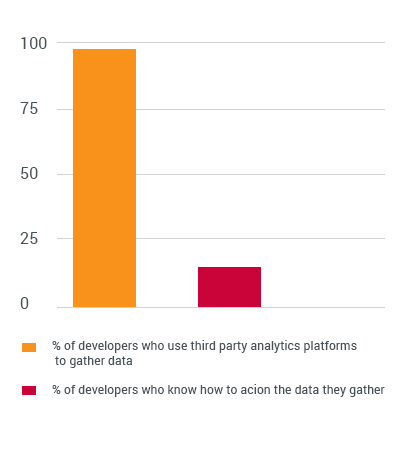 Figure 2: How app development companies take advantage of analytics data? In other words, 90% of app developers overpaid for app promotion, which entails no benefits! The thing is that there are certain app metrics app owners should pay attention to. The most important ones include user base, app session length, session interval, time in app per user, retention, lifetime value, etc. If these metrics are positioned well, they can encourage progress and boost your ROI.